George Roman has a nice office. It’s in a corner on the top floor of Boeing Co.’s tower north of Lambert-St. Louis International Airport. Through the floor-to-ceiling windows you can look up and see a stream of passenger planes landing, or look down and see the vast plants where fighter jets are designed and built. On the wall there’s a picture of Roman with President Bill Clinton, a framed letter from President George W. Bush, and plaques honoring Roman’s work with the U.S. Marine Corps. 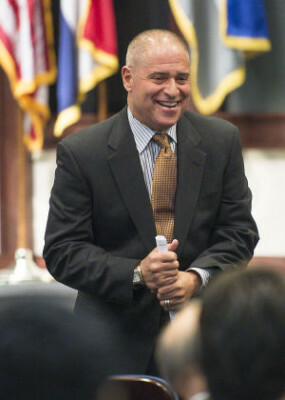 But last week, Roman started packing up that office, getting ready to retire after 34 years with McDonnell Douglas and Boeing, a career that climbed from a job on the Harpoon missile program to a post heading state and local government operations for a fully integrated aerospace giant. Along with that national portfolio, Roman has also spent the last few years as Boeing’s St. Louis regional executive. That made him point man to St. Louis for one of the area’s biggest employers, and the company’s representative on big local boards such as Civic Progress and the St. Louis Regional Chamber. And he’s one of Boeing’s highest-ranking executives to still have McDonnell Douglas roots. All of that gives him a unique view on the company’s evolution here in St. Louis. Things have changed a lot since the McDonnell days, he said. He pointed to the P-8 Poseidon, a Boeing-built anti-submarine plane that’s putting military technology onto the airframe of a 737 jetliner. Pre-merger, designing and building a plane like that would have involved complex corporate partnerships, he said. Now it’s all done in-house at one company. The KC-46 tanker, built on a 767 airframe, is similar. And Boeing can borrow advanced commercial wing technology to help design new fighter jets. All of it makes the company’s products more competitive for scarce Pentagon contracts. And while work on those commercial-based military aircraft is centered in Seattle, not St. Louis, the blended “One Boeing” approach has boosted business here, too. Just in the last few months the company has announced it will shift about 400 IT jobs and at least 300 research and development jobs out of Puget Sound and into St. Louis over the next couple of years. And engineering teams here are increasingly contributing work to commercial side projects, helping to stabilize employment at about 15,000 despite belt-tightening on defense work. Adding commercial work to Boeing St. Louis’ traditional focus on defense will help operations here in the long run, Roman said. That’s a big part of the thinking behind the region’s recent push to attract Boeing’s 777X assembly line, which would immediately make St. Louis a hub not just of defense but commercial aerospace. While Roman was involved in early meetings with state officials about Missouri’s bid for the plane, there wasn’t much he’d say about the overall competition, which is being run by Boeing Commercial executives out of Seattle and top corporate officials in Chicago. They’re busy narrowing 22 states’ proposals down to a short list, and they’ll likely make visits to a few before choosing a site, probably in late January. No matter where the 777X winds up being built, Boeing has a strong future in St. Louis, Roman said. Three of the defense unit’s four divisions are based here, and the company has invested $470 million in facilities in St. Louis since 2000. Still, there is growing concern about the future of the F/A-18 Super Hornet, which is built up the street from Roman’s office and supports thousands of jobs at Boeing and its suppliers. The current Navy contract runs out in 2016 and Boeing says it will need to decide soon whether to float its own cash to suppliers in the hopes new orders emerge, or start the two-year process of winding down production. And just Wednesday, Boeing lost out on a big foreign order from Brazil. Still, speaking Tuesday before Brazil’s decision, Roman said he’s confident the Super Hornet will still be built for years to come. If Roman sees a good future for Boeing in St. Louis, he sees a good future for himself and his family here, too. A Pittsburgh native, he’s lived off-and-on in St. Louis since 1980, and sits on several local boards, including Mercy Hospital, the St. Louis Police Foundation and the recently formed Better Together initiative. He plans to stay involved, and, as a Marine’s son himself, Roman plans to keep working with the Marine Corps Scholarship Foundation, which helps children of Marines pay for college. At age 57, he’s not yet sure what might come next professionally. After he cleaned out that big office this week he was planning to head to Florida for some quality time with his family. “I’m going to relax a bit,” he said.